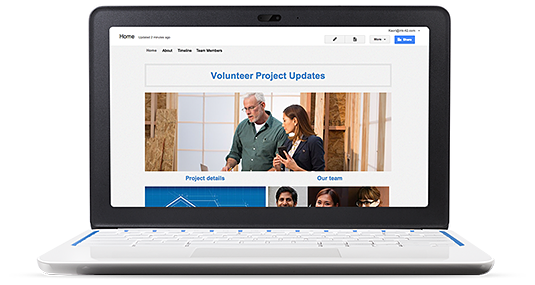 Build company intranets, team project sites, customer portals, and more—no IT help needed. 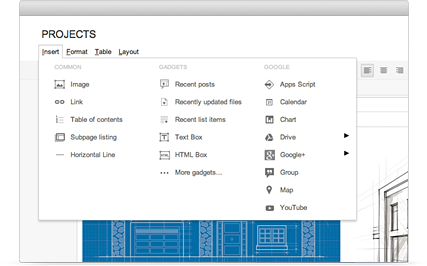 Create sites as simply as writing a doc through an intuitive editor. That means teams don’t have to rely on IT specialists or web developers. Develop team sites with important content from projects, the latest sales materials or details about the company picnic. Use Google search to find the right information across all of your internal sites. Make it easy for sales, support or anyone at your company to find their answers fast. Manage which individuals and groups have permission to view or edit your site. Choose to make it available to certain coworkers, your entire organization or anyone on the web. Can Google Sites appear under my domain URL? Yes. Your project site can appear under your custom domain URL. As people navigate your site, they will remain on www.yourcompany.com unless they click an external link. Yes. People outside your company can access your site, even without a Google Apps account. You can also opt to restrict access through sharing settings.